The annual Northumberland Mark v Craft golf challenge – The Pledger Cup – was held on Thursday 26th July 2018 at the splendid and very picturesque Rothbury Golf Course. Once again the Craft was victorious but the margin of victory was much lower than in previous years and bodes well for a Mark victory in the near future. 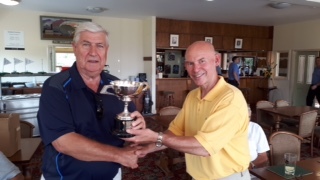 Captain of the Mark team, Stuart Cairns, presents the Pledger Cup to the Captain of the victorious Craft team, John Hannon.